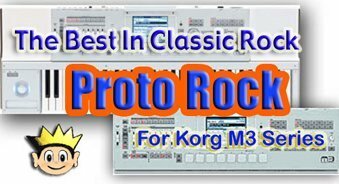 The Patch King pleased to announce the release of Proto Rock. 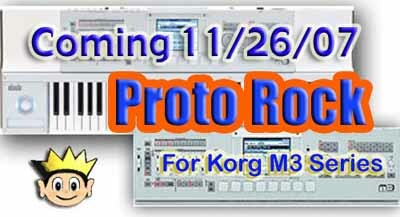 Our first collection of sounds for the Korg M3 Sampler/Workstation. 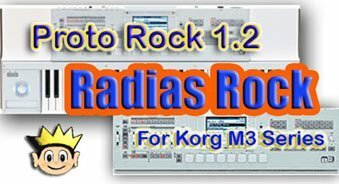 Proto Rock contains 64 programs, 64 Combis and over 50 Megs of new samples. All for only $60. US dollars. We are very excited to announce that we have just released four new refills for Propellerheads popular “Reason” software program. This is the first in a series of new sounds that we plan on programming for Reason so stay tuned for much more coming over the next few months. Refills Include: Killer Keys, Vintage Synths, Drum & Bass and Midi Mix which include a wide variety of sounds which is bound to spice up your Reason tracks. Sounds are compatible with Reasons NN-XT sampler, Redrum and Dr Rex modules. 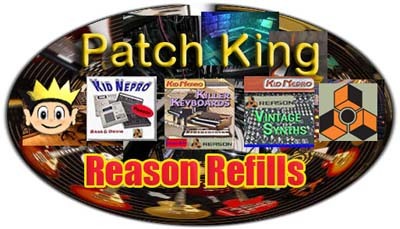 The Patch King is also offering all our Reason sounds as individual downloadable files for only $5. per file. 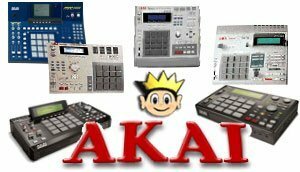 Get yourself everything from a custom Hip Hop Drum Kit to a set of Mini Moog basses for only $5. Mix and match sounds from all of our collections and create your own custom refill. More info at the Propellerheads section of our web site. Tape recorder or computer interface connections; Connect cable from your tape recorders or computer audio interface “output” to the rear “input” on the Juno-60 (LOAD). 1- Set the tape or software program so it will be played back from the very beginning of the data (where you hear a pilot tone). 2- Set The Memory Protect switch on the rear panel of the Juno-60 to OFF. 3- Set the tape recorder/software to PLAY, then press the LOAD button (8) on the Juno-60. The LOAD indicator will light up and the program number display window becomes blank, showing that the data has started. Be sure to press the LOAD button before the modulation tone is heard. If the load button goes out and the program number display window shows double dashes (–), the loading is complete. If error message occurs adjust output level on your tape machine. If the output level is too high or too low you will get an error message. Experiment to find the proper level for your equipment. Also make sure to press the load button at the right moment. Tape recorder or computer interface connections; Connect cable from your Juno-60 “save output” to the “Line input or Mic Input” on the Tape recorder or computer audio interface. 1- Set your tape recorder or software to record mode. 2- Press the SAVE button (#6) of the Juno 60. The save indicator will light up and the program number shown in the display window will go out. Also. the pilot tone will be sent from the SAVE jack. 3- If you tape recorder features the recording volume adjust knob, adjust it so that the pilot tone registers near 0 db. In 4 or 5 seconds the Juno-60 produces a modulated tone, i.e.saving into the tape recorder/software begins. (be sure to complete adjusting the recording level before the modulated tone is heard. Many of you have just picked up an old synthesizer and it did not come with an owners manuel. Since there seems to be little info available online, we have been getting many requests for more info on how to load and save sounds into vintage synthesizers via the data cassette port. We’ve started things off with how to load & save sounds into the Roland Jupiter-6. Tape recorder or computer interface connections; Connect cable from your tape recorders or computer audio interface “output” to the rear “input” on the Jupiter-6 (LOAD). 1- Turn off the “memory protect” switch in the rear of the Jupiter-6. 2- Adjust the output level on your cassette player/software. The best loading levels are at “0” DB. Once the adjustment has been made, begin the tape/wav playback with the pilot tone and press the Jupiter-6 “load” switch. 3- The data will begin to load into your Jupiter-6. Each Bank light should flash one at a time as the data is loading in. If one or more begins to blink then an error has occured. In this case adjust your output levels and try again. Jupiter-6 If none of the banks blink then all has loading in OK. Tape recorder or computer interface connections; Connect cable from your Jupiter-6 “save output” to the “Line input or Mic Input” on the Tape recorder or computer audio interface. 1- Press the Jupiter Dump or Save button. The Jupiter will send a pilot tone to your tape recorder/software. Adjust your recording levels on your tape recorder so that the tone reads at about “0 db”. 2- Begin recording with your tape recorder/software, beginning with a clear portion of the pilot tone. The Jupiter will soon produce a modulated tone and begin to save the banks one at a time. 3- When the Jupiter has dumped it’s entire memory, the pilot tone will appear again. Record a few seconds of the pilot tone. We have found that the best tape recorders to use for this kind of data transfer are those small portable ones that you can get at radio shack for about $50. The ones that are usually used for recording voice lectures and that kind of stuff. The key feature is that the tape recorder must have an “adjustable output” so you can control how much signal the synthesizer will receive. That’s critical when transferring data this ancient way. Most of the old analog synths from the 80’s that use the cassette interface need to have everything just right or else you will get the dreaded “error” message. Of course, if your using a computer to transfer the WAV file, that will make your life a bit easier. However, you still have to make sure that your output level is right to avoid getting errors. Simply adjust the output level of the wav file to suit your equipment.